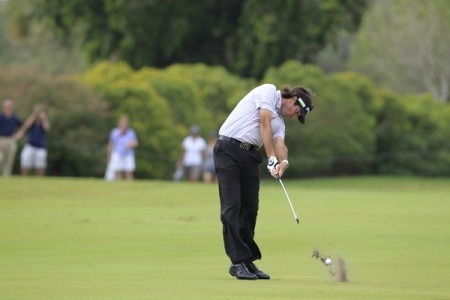 Bubba Watson hits his second shot to the eighth at Doral’s TPC Blue Monster. His three-iron from 227 yards finished seven feet away and he knocked in the putt for an eagle three to get to 10 under for the day. 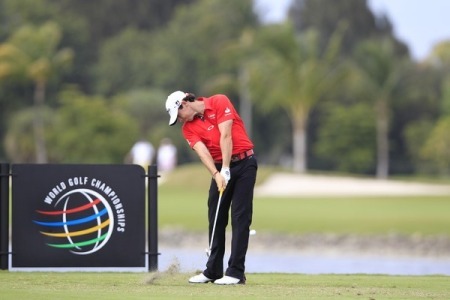 Photo Eoin Clarke/www.golffile.ieRory McIlroy bounced back from his “flat” opening 73 with a three under 69 but he still finished the day 10 shots behind leader Bubba Watson in the WGC-Cadillac Championship at the TPC Blue Monster. The world No 1 began the day tied for 35th on one over but he moved up just seven places to 28th alongside Graeme McDowell (67) despite firing an eagle and five birdies on a day when Bubba Watson blasted a 10 under 62 to lead by a shot from Justin Rose on 12 under par. McDowell was also in the mood as he carded an eagle, five birdies and two bogeys in a super 67. But left-hander Watson was on fire as he carded an eagle, nine birdies and just one bogey in his 62 to threaten the course record 61 set by Stephen Ames 12 years ago. Rose had an immaculate, eight under 64 alongside Watson and their betterball of 59 left Mark Wilson scratching his head as he completed their threeball with what looked like a very ordinary, two under 70. 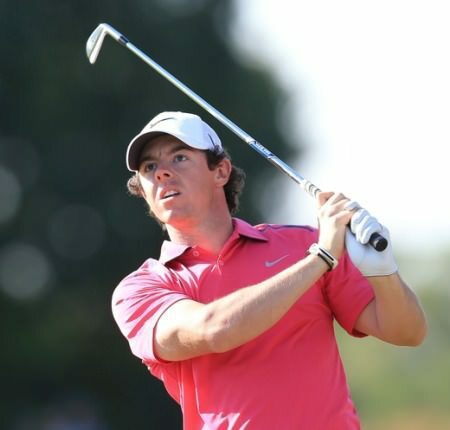 McIlroy eagled the first and birdied the second from three feet each time to get to two under for the tournament but while he recovered from bogeys at the third and fifth with birdies at the 10th, 12th, he mixed birdies at the 16th and 17th with bogeys at the 14th and 18th to finish well off the pace. “There was a 62 out there obviously,” McIlroy said. “After the start, I felt something in the low 60s definitely was out there. Bubba shot that and there was a couple 64s out there as well. Luke Donald can steal back his world No 1 ranking from McIlroy with a victory here but while he shot a 68, the Englishman was still six shots off the pace on six under and tied for 10th. 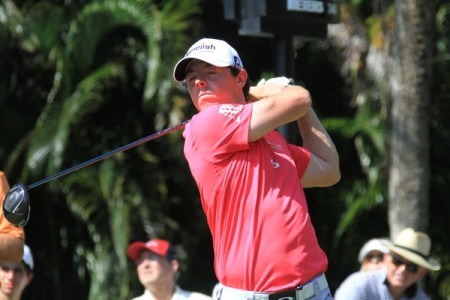 Rory McIlroy hits to the par-three ninth at TPC Blue Monster on Friday. He shot a three under 69 to share 28th place with Graeme McDowell (67) on two under. Photo Eoin Clarke/www.golffile.ieJoint overnight leader Adam Scott posted a 68 to sit alone in third place, two shots off the pace on 10 under with Anders Hansen (65) in solo fourth on eight under and Thomas Bjorn (68) and US PGA champion Keegan Bradley (67) tied for fifth on eight under. Tiger Woods made a move but while he kept a bogey off as he posted a 67, he was still seven adrift of Watson and tied for 13th on five under. Darren Clarke cut a forlorn figure after a second successive 74 left him near the back of the elite field on four over. He has been in limbo since he won The Open last July with his best finish in a full field event a share of 35th in last September’s Omega European Masters in Switzerland. “He’s very happy with how he’s playing but he’s in one of those cycles where he is not playing that bad but good things just aren’t happening,” said Clarke’s former coach Butch Harmon. Phil Mickelson (71) and world No 3 Lee Westwood (67) finished the day 11 shots off the pace on one-under. No need to look. Rory McIlroy hits his drive 308 yards down the middle of the 17th at the TPC Blue Monster. Photo Eoin Clarke/www.golffile.ieRory McIlroy threatened to shoot his first 59 but ended up disappointed with a 65 as benign conditions turned the Blue Monster into a pink fairy in the WGC-Cadillac Championship. Rory McIlroy is expected to give a frank interview when he faces the media in Miami on Tuesday at 9.30am. Picture: Fran Caffrey / www.golffile.ieRory McIlroy will open up about his suprising Honda Classic withdrawal and confess that severe pain and frustration with his game got the better of him in Palm Beach Gardens. Rory McIlroy and Graeme McDowell might have work to do to be ready for the Masters but while the Portrush man was upbeat about his performance and the course, the Holywood star was utterly frustrated after a trying final day in the WGC-Cadillac Championship at Trump National Doral.